Rugged, small form factor (SFF) embedded vision has a long history of use in military embedded systems. ISA and PCI bus NTSC frame grabbers have been in rugged, military use for well over 10-15 years in a variety of surveillance and imaging applications. The more recent availability of SFF PCIe/104-Express frame grabbers now make possible NTSC/PAL multi-channel D1 image capture at full frame rates with a robust set of overlay features. 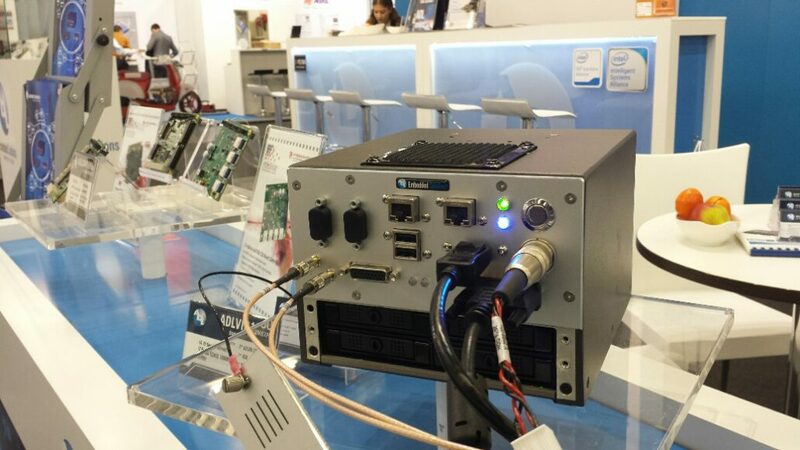 For high-performance applications with high-resolution or high-speed requirements, the workhorse camera interface technology for rugged, SFF embedded vision has been dominated by Camera Link technology. This is supported by rugged, SFF PC/104 solutions from vendors like EPIX, Inc. in the USA and Active Silicon, LTD in Europe. However, these first-generation SFF Camera Link products have mostly been simple copy-and-paste derivations of PCIe desktop designs. The early designs implemented large, desktop-oriented connectors with thick, unwieldily parallel LVDS cabling which creates significant fit issues for the SFF system engineer. Next generation military embedded vision systems have a number of factors driving its rapid deployment. While 4K resolution has been very popular in consumer products for a few years now, only recently it is being seriously discussed for new military projects. This is motivated by the ever-present demand for higher image resolutions at higher frame rates for all applications. New imaging applications are being created using hyperspectral and multispectral technologies with camera framerate requirements of 1000 MB/s and beyond which really highlight the shortcomings of current image capture frame grabbers. Combine the availability of Intel processors with high-resolution digital display ports, 4K-resolution rugged cameras and rugged, SFF CoaXPress frame grabbers and the timing is right for a serious transition to next-generation rugged SFF embedded vision solutions. Rugged, SFF CPU board solutions are readily available from a number of vendors with the latest Intel Core processors featuring DisplayPort with 4K resolution at greater than 30fps and high-performance integrated graphics engines. Rugged, 4K@30fps cameras are now being released by companies such as ADIMEC Advanced Image Systems b.v. and hyperspectral and multispectral cameras are available from a host of other vendors. Many of these camera vendors are seeing their highest growth rate in rugged SFF vision applications outside of their traditional markets. To complete the link between the CPU and the high-end Camera device, companies like Euresys S.A. are expanding their desktop Coaxlink series to include rugged SFF, CoaXPress (CXP) frame grabbers with a bottom-up approach that is truly optimized for SFF applications. This rapidly growing vision segment includes not only military applications, but also commercial drone and unmanned systems for agricultural, scientific, government and civil applications. The CoaXPress standard was designed to address many of the shortcomings of Camera Link technology relating to bandwidth, cabling distances, power distribution and scalability. The CoaXPress serial 8B/10B architecture allows for slim, coaxial cabling capable of distances over 100m at CXP-3 speed of 3.125 Gbps and 40m at CXP-6 speed of 6.25 Gbps. Similar to PCI-Express, CoaXPress can aggregate cable lanes for higher aggregate bandwidth imaging applications. For example, two CXP-6 cables = 12.5 Gbps total bandwidth, four cables = 25 Gbps total bandwidth, eight cables = 50 Gbps and so on. At 12.5 Gbps, 8B/10B encoding yields an effective camera framerate of 1200 MB/s which scales up readily with the number of ports. CoaXPress cameras with two and four CXP-6 ports are readily available. For rugged SFF embedded vision, CoaXPress vendors have focused their attention on the PC/104 standard. The PC/104 form factor has been at the heart of SFF embedded design for many years in military and rugged industrial applications. Originally conceived as a stackable form factor for rugged military use in the mid-90’s, the PC/104 form factor has evolved into the form factor of choice for compact, rugged applications in a broad range of industrial and military environments. Additionally, the PC/104 form factor has a rich ecosystem of peripheral functions which help fulfill other I/O needs that usually go with an embedded vision system such as special communication protocols like CAN, ARINC 429 or MIL-STD 553, additional LAN and USB 3.0 ports, etc. For Euresys S.A., partnering with a PC/104 vendor like ADL Embedded Solutions, Inc., gives them access to PCIe/104 technical and design support and also a solid PC/104 SBC portfolio, COTS MIL-STD 810 chassis products and longtime rugged SFF design expertise. This allowed them to design a rugged CoaXPress solution based on the Coaxlink Duo PCIe/104-MI frame grabber that is truly optimized for SFF rugged use from the ground up. 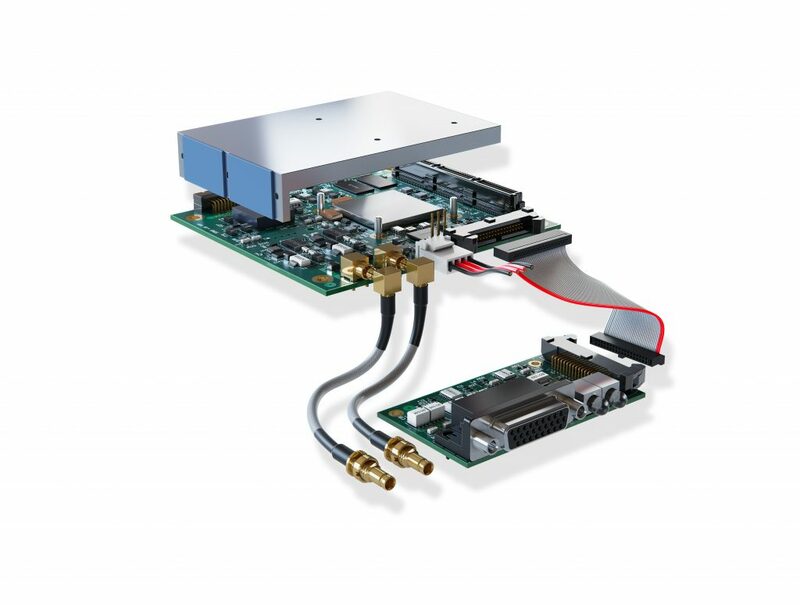 The combined PCIe/104 CoaXPress assembly shown in Figure 1, boasts an Intel Core i7 Quad SBC with a 2-port CXP-6 CoaXPress board and thermal spreaders for easy SFF chassis integration. The breakout I/O board provides status and activity LEDS, as well as a GPIO interface. Other features include 17W power-over-CXP (PoCXP) and Memento Event Logging. For military applications, this combined solution has been validated for -40C to 85C operation and MIL-STD 810 shock and vibration using an ADL Embedded Solutions, Inc. COTS chassis. The I/O can easily be adapted for MIL-DTL D38999 connectors. This CoaXPress assembly can be designed into very compact embedded vision systems like the industrial solution shown below from ADL Embedded Solutions, Inc. It features an Intel Core i7 SBC, 2-port CXP-6 card, 4 removable 2.5” SATA drives, plus room for up to four mPCIe modules or additional LAN/USB 3.0 ports. Overall dimensions of 5” x 7” x 7.6” can be achieved in either industrial or MIL-STD 810 COTS chassis packaging. The advent of innovative SFF cameras, CoaXPress frame grabbers and other building blocks optimized for rugged embedded use is sure to spur the deployment of rugged embedded vision applications in a variety of military and rugged industrial use scenarios. In addition, emerging camera technologies for multispectral and hyperspectral imaging will continue to find new applications in a variety of settings and usher in a host of next generation vision applications beyond the confines of the factory floor into commercial drones and other unmanned systems applications, border and port security, and many other emerging market segments.